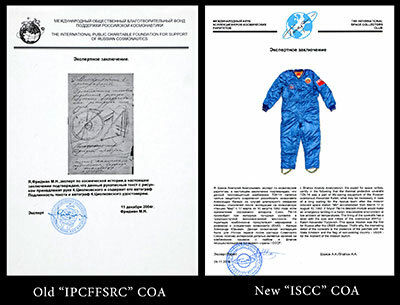 "Interesting" supposedly flown Russian items are once again appearing on eBay, accompanied by a COA issued under the name of an organization calling itself "International Space Collectors Club" (Международный Клуб Коллекционеров Космических Раритетов). This COA looks suspiciously similar to those issues by the "International Public Charitable Foundation for the Support of Russian Cosmonautics" (МЕЖДУНАРОДНЫЙ ОБЩЕСТВЕННЫЙ БЛАГОТВОРИТЕЛЬНЫЙ ФОНД ПОДДЕРЖКИ РОССИЙСКОЙ КОСМОНАВТИКИ), which is now defunct, but seem to have been an entirely fictitious organization created to issue official looking COAs. These COA are discussed at length here. As you can see from the attached images, the wording of the certification follows the same boilerplate format and uses the same phrasing, the masthead features the same double-line, the logo is similar, as is the circular handstamp used to "certify" the COA. Also, they all feature the same odd title for the certifiers: "Expert" So and so. Although there is every possibility that the items being sold with this new "International Space Collectors Club" COA are what they are said to be, it's worth exercising due diligence (and perhaps a good bit more than usual). 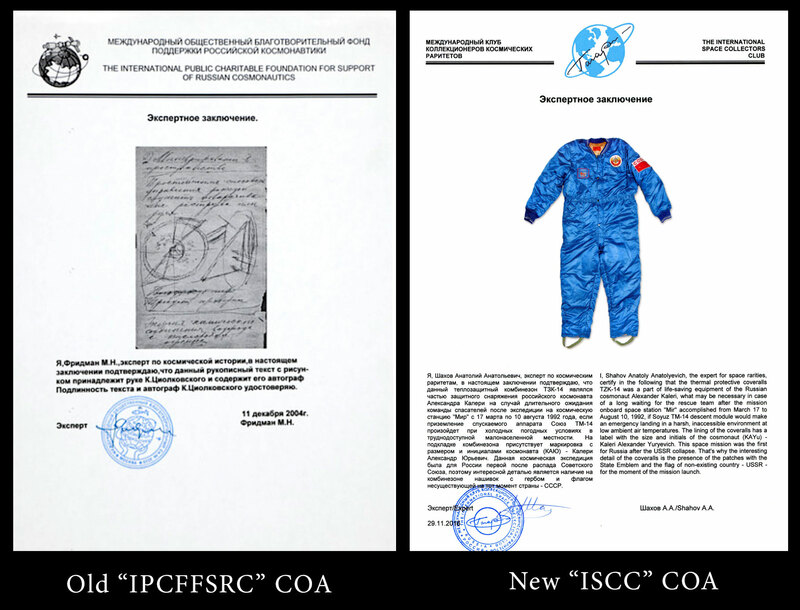 As you will see in the thread I link to above, serious doubts have been raised concerning items sold with the almost identical "International Public Charitable Foundation for the Support of Russian Cosmonautics" COA. Looks like the same folks, so be careful. Thank you for the head's up! Thanks again for making us aware, really appreciate it! This seems to be more for hardware artifacts, have you seen any cautions for any flown coins/medallions? There is an item with a COA from that trust on eBay now (183700513282). It looks like Regency Auction was not aware.